Facewash - Dr Bronner's Bar Castile Soap. I was using Neutrogena's Oil Free Acne Wash for a long time and love it, but they don't use certified sustainable palm oil and also the plastic packaging so I switched it with a bar soap. Dr Bronners soap is not oil free but it's only a wash so the oil isn't on my skin long enough to soak into my clog-prone pores. It isn't as gentle as a liquid wash, but lathers up nicely and I usually only feel the extra tightness of dry skin after I've been in the pool or on a bad skin day - which thankfully is rare these days. I'm currently using the lavender scent which reminds me of a soap my Aunties used to have in their bathroom. It makes me happy, but I'll try the rose or citrus scents next for funsies. SPF moisturiser - Cetaphil DermaCare Moisture SPF 30. I want to break up with Cetaphil because palm oil and testing on animals and the plastic bottle. But I haven't been able to find an alternative yet. If anyone knows a gentle, oil-free ('cause acne) SPF (cause meds) face moisturiser, please let me know! In the meantime, I've found this moisturiser to be the best for my skin. It's very gentle, the moisture is subtle and absorbs nicely. Makeup remover - Byphasse Micellar Water. I do love the convenience of wiping my eye make-up, blush and face moisturiser off at the end of the day. It's very gentle and nourishing. When I wash my face at night instead of using micellar water my skin gets dry and tight. But it does come in a plastic bottle and I'm trying to reduce my waste so once I finish this bottle, I will swap to coconut oil, which comes in a glass jar to remove eye make-up. Then I'll use Dr Bronner's Bar Castile Soap to wash my face and with the new night serum I've found, I hopefully won't have tight, dry skin from washing twice in one day. Night serum - Acure CGF Oil Free Serum. If only I could use rosehip oil on my skin without breaking out. I've been looking for an oil-free night cream for yonks, and came across this serum on Biome Eco Store's website so thought I'd give it a shot. I bloody love this serum. I wake up each morning and my skin is glowing. I don't have bad skin days anymore, which happened because I lost too much moisture overnight especially over winter. 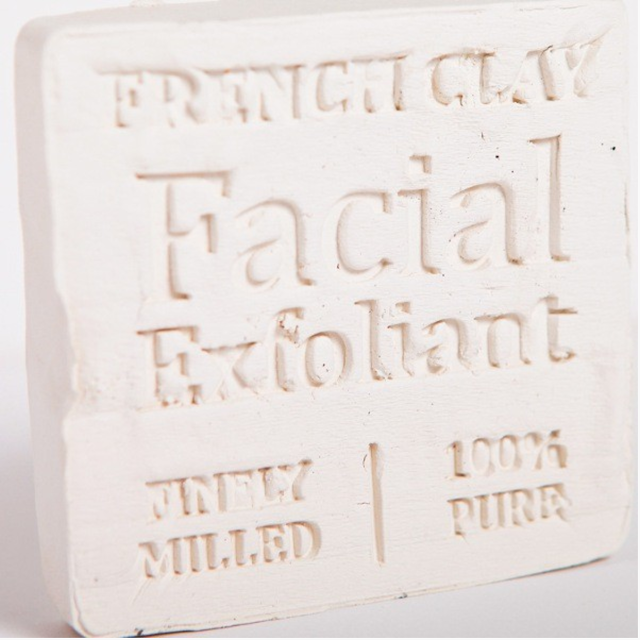 Face mask - Corrynne's French Limoges clay face block. I stopped using face masks for a long time because the packaged sludge in chemists and supermarkets has oils or other chemicals to keep it in sludge form, causing my skin to break out because face masks sit on your face long enough for fat pores to gobble up all the bits it needs to go clog itself. I came across this face clay while browsing Biome one day and have never looked back. It is my friend for life. You apply water to liquify the surface then rub it on your face. Leave it to dry like regular packaged face masks, then wash off. My skin feels smooth and refreshed afterwards. I use this once every 1-2 weeks, and one $6 block has lasted me months. Best of all, it has no plastic packaging going into landfill and no chemicals mixed into the clay to keep it in a sludge form. Lurrve it. So there you have it - all the things that take care of my face. Hopefully some can help take care of your beautiful face too. If you know any oil free, plastic free alternatives I can try, please let me know.